Construction: RHG (Steel hatch): 14 gauge galvanized steel with 12" high curb and 3-5/8" wide flange for securing to roof deck. All corners are fully welded and mitered. Hinge is a heavy duty box-type. 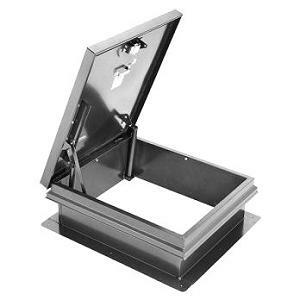 Cover: 14 gauge galvanized steel exterior and 22 gauge liner with with a TPE rubber draft-seal gasket door seal. One inch thick fiberglass insulation liner is built into cover. Insulation: The curb includes a 1" fiberboard insulation surrounding the base, and 1" fiberglass insulation between the exterior cover and liner. Hardware: Hardware includes corrosion resistant heavy-duty hinge, slam latch, heavy gauge automatic hold open arm with red grip, compression spring-operated cylinders, exterior handle with integral padlock hasp, and interior locking handle with interior padlock hasp. Finish: RHG (steel hatches): Bonderite® Grey Hammertone color powder coat. Optional Colors: Red, Yellow, Bronze or other can be ordered with special order. $40 additional. 7-10-day leadtime. Optional Features: Double Wall Curb, Safety Posts, Roof Hatch Warning Light, Various Locks, Stainless Hardware. CROSS REFERENCE HATCHES: Bilco model S-20, Acralight model S-RH-3036, Milcor model M-1, Babcock Davis 6-101, Dur-Red LH.G, Karp KRHP-2.